I know a lot of people say that clowns are scary. I have never found clowns to be scary, generally speaking but I do have a bad experience with a Seafair clown. I was 14 years old and had just completed the 8th grade. I can’t remember which of the Seafair parades I was attending but it was my first Seafair parade. Unfortunately, this parade marked another first for me, my first kiss, given to me by a Seafair clown. He planted a wet one right on my lips when I least expected it. Imagine being a 14 year-old girl and getting your first kiss from a middle-aged Seafair clown. Yuck! Fast forward thirty-one years a year or two later, to the summer of 2011. 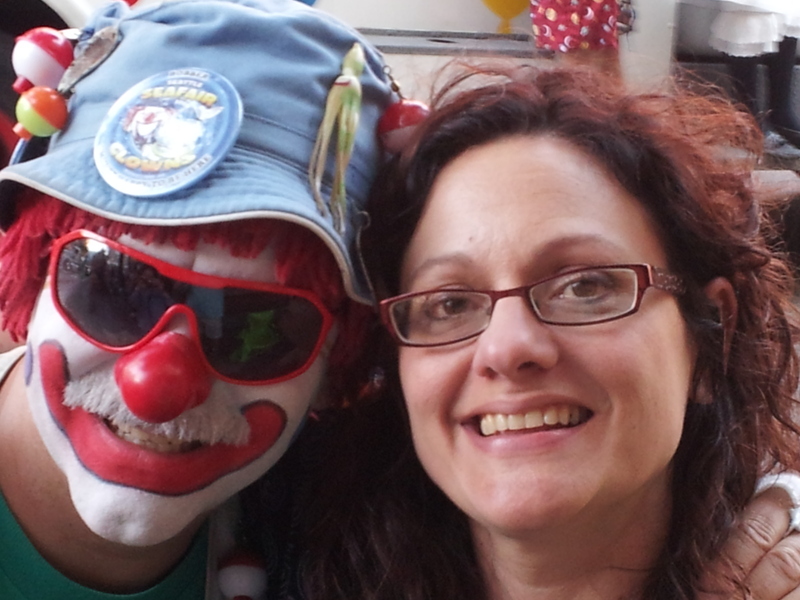 I was attending the Chinatown Parade, my first Seafair-clown attending event since my unfortunate teen-aged experience. I was approached by one of the clowns and my dad wanted to take our picture together. Honestly, my stomach lunged a little from anxiety. But he looked trust-worthy and I gave it a go. He was a gentlemanly clown and we took a nice, healing photo together. I am hoping for some healing tomorrow, too. I am looking forward to just being a mom at a parade, cheering on her kid. “Dark, evil clown nature.” Hee!